Meet Sammy, your darling doorstop pal made from sturdy coconut fibers. Sammy didn't choose the greeting life, the greeting life chose Sammy. It must have been her incredibly warm smile and super slow pace. We think there's no cuter creature to welcome you home or send you off each day. The whimsical rug is crafted from sturdy coconut fibers, and features a coastal scene with gold-flecked details and a vibrant turquoise backdrop. It adds a darling touch and a little "aww" factor to your doorstep. Made in India. 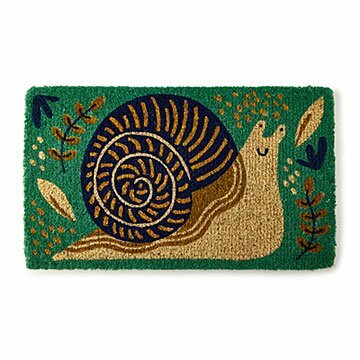 This mat looks cute and seems durable. It will more than serve its purpose. I gave it a 4/5 because for the price, I liked it a bit better in the photo than in person and because it's so thick that it's higher than my doorstep. the difference in height will take some getting used to.